In this nautical expansion for Torchbearer, players must keep their ship fueled and their crew fed as they sail into strange waters. After facing bizarre monsters, hostile ships, and rifts in reality, players can plunder the ruins of an old empire and hopefully make it back to port with a few coins to their name. 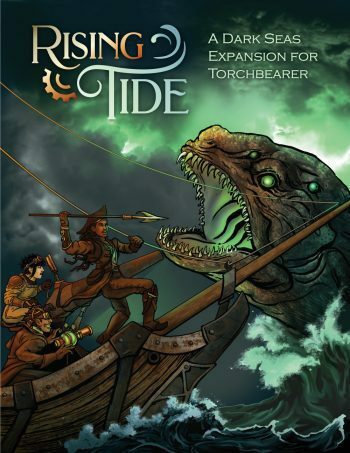 Designed by Mythcreants’ own Oren Ashkenazi, Rising Tide will bring a gothic steampunk adventure to your table. Purchase includes a 189-page full-color digital rulebook and interactive sheets. As an expansion, the Torchbearer core rulebook is required for play. A Fallen Empire: In days long past, a technologically advanced Island Empire ruled sea and shore alike. The Empire is gone now, shattered by cataclysm and civil war. But fragments are scattered on surrounding islands and beneath the waves, ready for daring explorers to plunder. 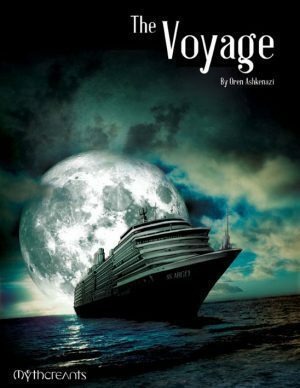 Strange Occurrences: Ships that dare to sail on the old Empire’s seas face strange rips in reality, creating bizarre changes to nature’s laws. The boiling point of water might drop or sailors could fall upward into the sky. Fascinating Adversaries: Otherworldly leviathans pour out of glowing rips in the air, emitting light to lure in prey or changing shape to evade capture. Clockwork automata guard the Empire’s ruins and even old Empire ships are said to still prowl these treacherous waters. Weird Science: The Empire’s advanced technology was possible because of a malleable, highly radioactive metal that puts off a soft green light. Sailors call this substance “glow.” The Scientist class uses carefully calibrated bursts of glow radiation to create spell-like changes in physics. Steampunk Contraptions: Outfitting both explorers and their ships, the Inventor class builds impossible devices based on discovered schematics from the lost Empire. The mechanics of Rising Tide allow strategic management of the players’ vessel and its resources. Players are given numerous options for customizing and upgrading their vessel based on the interests and strategies they choose to pursue. A Rising Tide group may want libraries and laboratories to study the strange phenomena they encounter or weapons and armor to defeat opponents. Following the innovative resource management of Torchbearer, players supply their ship with resources like food and fuel in port and then engage in calculated risk-taking to support their venture. After facing harrowing occurrences and close encounters with enemies, the group may gain ship conditions like Failing Power or Mutinous Mutterings. If their voyage is successful, they’ll have enough treasure to repair their ship and set sail again. Rising Tide is designed to work for a variety of play styles. The nautical steampunk setting is flexible enough to allow game masters to fill in their own story while skipping all the hard work involved in creating conflicts and rewards for players. Players can take quick character classes or customize their skill options. They can ponder over their first vessel or use the pre-built starter ship to set sail right away. This expansion combines the best parts of Torchbearer with stunning new design elements, bringing new horizons to your games. Featuring intuitive gameplay in a lively and surreal Age of Steam setting, Rising Tide is a delight to pick up as either a player or game master. With new mechanics for building a ship as an extension of the party, challenges that reward creative cooperative play, storms to survive, and leviathans to slay, this expansion will keep your table occupied for countless sessions.